On our return from the 2-day camping trip, we stopped at Kelly's RV in Apple Valley to arrange to have a propane line installed inside Scampy. This line will terminate just inside the cabinet below the kitchen sink. The end of this propane line will have a quick disconnect which contains a shut-off valve. This shut-off valve gives extra protection against any leak from the quick disconnect. The purpose for the installation of this propane line is to have a connection for the Wave 3 catalytic heater. We erred in having a propane tank inside Scampy. This new line corrects that error. Just before arriving back in Apple Valley, a clunking sound began in the area of the trailer hitch. We returned to A&B Hitch to have the clunking checked out. Owner Mark went for a test drive in order to find out what was going on. It was determined that the hitch was working inside the receiver. And that working created the clunking sound. The hitch was altered so that it now enters the receiver an additional 3-inches. This change should prevent this problem from occurring again. There have been comments from readers about whether the Honda should be towing Scampy. The reason for the doubt is that Honda states that the FIT should not be used as a tow vehicle. However, Honda does allow the use of their Honda Jazz as a tow vehicle. The Jazz is what Honda named the FIT when sold in Europe. 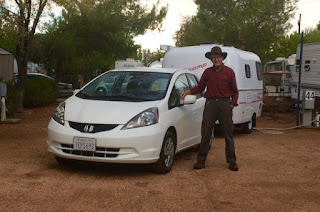 We now have personal experience towing Scampy with our Honda FIT. There is more than enough power from our Honda FIT to tow Scampy. Also, braking is extremely good. Scampy weighs in at 1,500 lbs, loaded with our stuff. Hitch weight is 100 lbs. During our 2-day camping trip with Scampy, Baby Boid began showing signs that he liked being close to me. While we were driving together, Boid positioned himself close as possible to me. This was a clear indication of his socializing with me. Boid is not afraid of my hand. 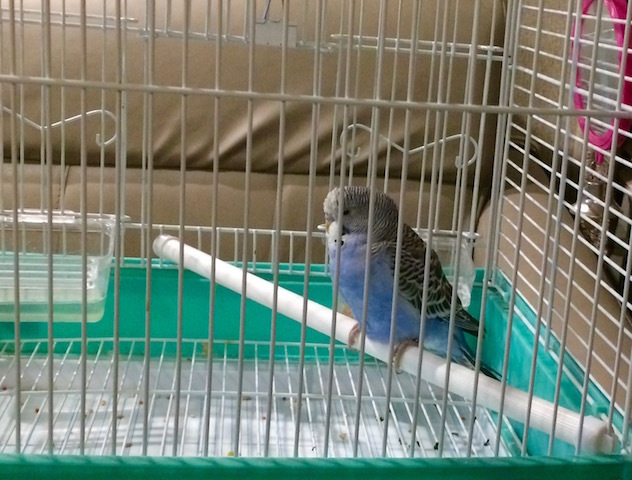 I'm able to place my hand in the cage, reach over and touch Boid's foot. Or touch his chest. 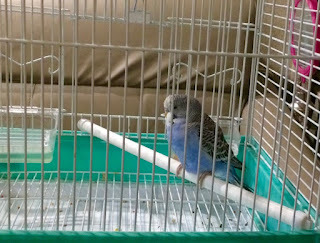 And he does not fly about frightened when my hand is in his cage. It will not be long before Boid will begin to eat his food from my hand. nervous or frightened, his head feathers make a small head. PS: Weight check tomorrow. I've signed up at Kaiser for my new primary care doctor. Part of the checking-in process is a weight check. I'm very interested in what my body weight is now. From the way that my pants fit, I must have lost a lot of weight. I'm eating much, much less now. Only eating when I'm hungry! Looks great , now you are having fun ! And a great tow vehicle. Hi George, I am enjoying your blog so much. So much fun to hear about your travels and technical modifications. These projects are really good for us. You don't have to worry about this but I just coated the under body of my class C with Fluid film for corrosion protection. Not a fun job but had to be done to use my camper in winter here in the north east. George, you're doing great! Keep up the great work in the blog. I am always learning something from you. I am sooooo happy to read your, "I am enjoying your blog so much" comment. Glad to hear about the propane line and quick disconnect. How's Lone Wolf working out? Lone Wolf RV Park is a swell place. Only $440/month. Quiet. Close to downtown Apple Valley. Please take this positively because I really care about what happens to you. I know that you have really enjoyed your explorations in your new Scampy, but wouldn't it be easier now to not have to worry about having several camps each day? I know from personal experience that California is a very expensive place to stay and that you really like to have non-campground (meaning not lots of people) sites. But there are lots of federal and state very inexpensive dry camping places not too far from you where you could stay for several days in one place and not have to drive around so much. In fact, now that you have a tow vehicle, you could explore in that. That would also enable you to relax more. It is a bit of a drive, but one of my favorite in CA is Hidden View at Hensley Lake. I was there three times last time and was the only camper other than the camp hosts! There is another COE campground at Pine Flat Lake that I need to check out one of these days. And this time of year, there are not very many campers around anyway. I suppose that may be how it appears. However, making Breakfast Camps, Lunch Camps, Afternoon Camps, etc., is how I've travelled for many years. It really is easy for me. Going to "a place" [a destination] and camping there, is not really my style. I don't set out to be someplace at day's end. I just camp along the way. I finally remembered not to use chrome to comment! George, I am so glad to see that you are "On the Road, Again". Its a Willie Nelson song. Its so great to see you fully enjoying your world, again. Yes! Being "On the Road Again" is great for me! It's great that your Honda is up to the task. How are the side mirrors on the Honda? Good enough sight lines along Scampy? I love making Blog posts. I missed being on-the-road and having that to Blog about. I've not had any swaying challenges. Scampy tows easily. The side mirrors are fine for me.